Researchers from Rice University have determined that no matter how small or large a tobermorite is, it will react to loading forces precisely in the same way. However, the strength of tobermorite will change when poked with a sharp point. Tobermorite is a crystalline analog of the naturally occurring calcium-silicate-hydrate (C-S-H) that makes up cement, which in turn binds the world’s most-used material – concrete. Ancient Romans used a type of tobermorite which is assumed to be a key to the renowned strength of their undersea concrete structures. According to Rouzbeh Shahsavari, a Materials Scientist at Rice, the finely layered material will deform in several ways depending on how standard forces such as tension, compression and shear are applied. However, the deformation will remain consistent among sample sizes. He performed the research with Lead Author and Graduate Student Lei Tao. The study appears in open-access Scientific Reports of Nature. Shahsavari and Tao developed molecular dynamics models of the material for their latest survey. Their simulations uncover three vital molecular mechanisms at work in tobermorite. These mechanisms are also likely responsible for the strength of C-S-H and various other layered materials. One is a displacement mechanism in which atoms under stress move together as they try to remain in equilibrium. Another is a diffusive mechanism where atoms move more chaotically. They discovered that the material retains its structural integrity best under shear and less so under compressive and then tensile loading. 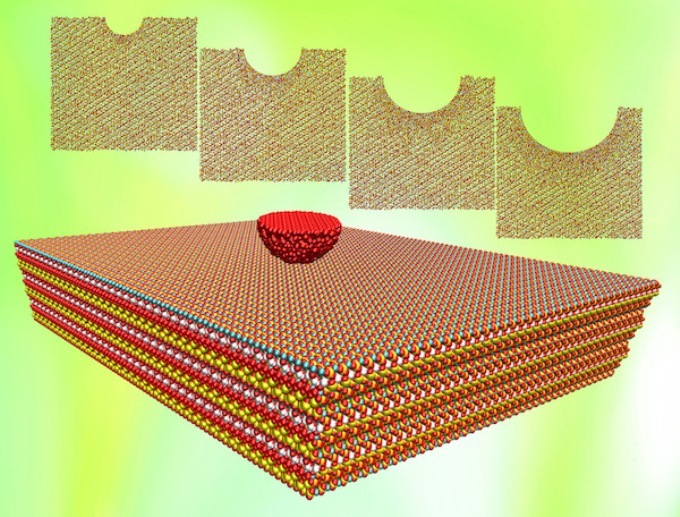 The third mechanism, by which bonds were formed between the layers when pressing a nanoindenter into the material, was more interesting to the Investigators. A nanoindenter, a device (simulated in this case), was employed to test the hardness of very small amounts of materials. The high stress during indentation prompted local phase transformations where the material’s crystalline structure deformed and formed strong bonds between the layers, a phenomenon not seen under standard forces. The bond strength depended on the amount of force and the size of the tip, unlike the macroscale stressors. There is significant stress right below the small tip of the nanoindenter. That connects the neighboring layers. Once you remove the tip, the structure does not go back to the original configuration. That’s important: These transformations are irreversible. Besides providing fundamental understanding on key deformation mechanisms, this work uncovers the true mechanical response of the system under small localized (versus conventional) loads, such as nanoindentation. If changing the tip size (and thus the internal topology) is going to alter the mechanics — for example, make the material stronger — then one might use this feature to better design the system for particular localized loads. The National Science Foundation (NSF) supported the research. Computing resources were provided by the National Institutes of Health and an IBM Shared University Research award in partnership with CISCO, Qlogic and Adaptive Computing and Rice’s NSF-supported DAVinCI supercomputer administered by Rice’s Center for Research Computing; the resources were obtained in partnership with Rice’s Ken Kennedy Institute for Information Technology.